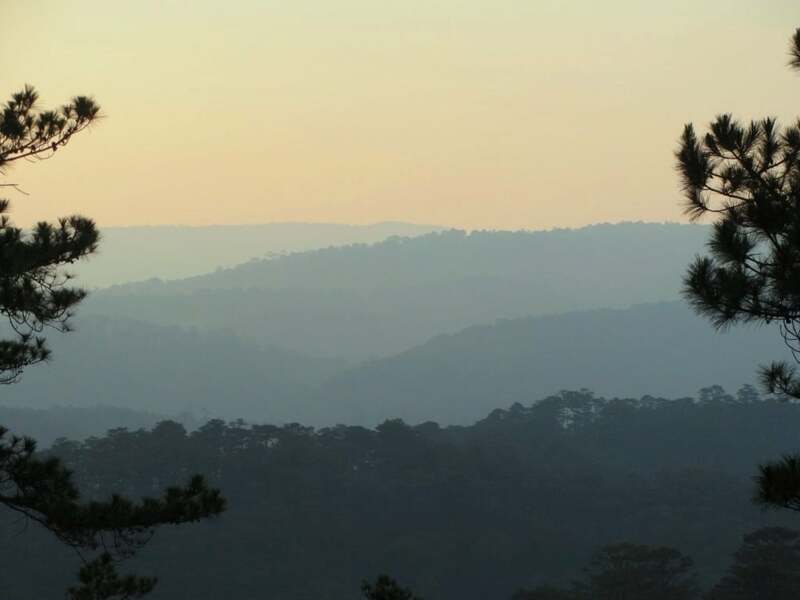 An enticing road leads north from Dalat, beyond Ho Suoi Vang (Golden Spring Lake), and into the remote forests and mountains of deepest Lam Dong Province. The scenery here is exceptionally alpine, characterized by coniferous forest and peaks rising to 2,500m (8,000ft). There are a couple of poor but friendly and interesting ethnic minority hamlets which make good stops. But, most of all, this route is about trees: deciduous and evergreen forests blanket the entire landscape. King among trees in this region is the pine, whose scent fills the crisp, highland air. 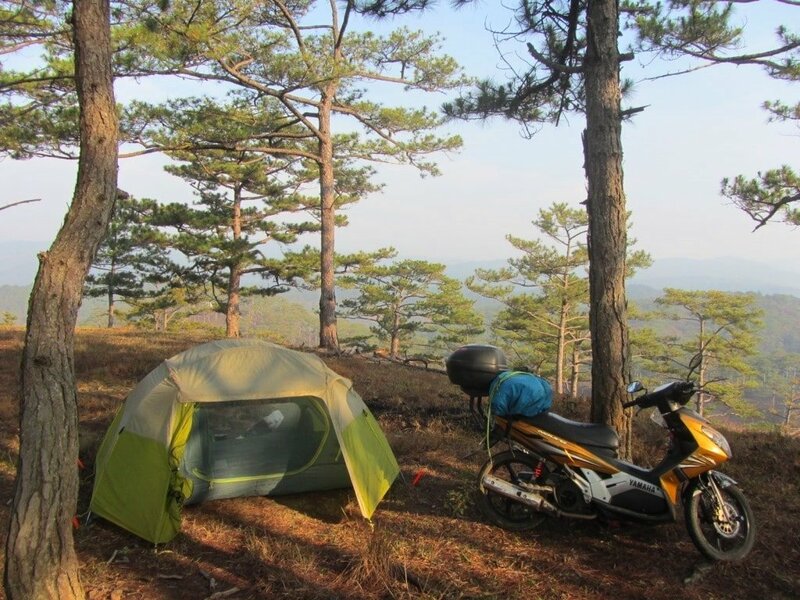 The Pine Tree Road is perfect for camping and picnicking, and is easily the most scenic day-ride from Dalat. 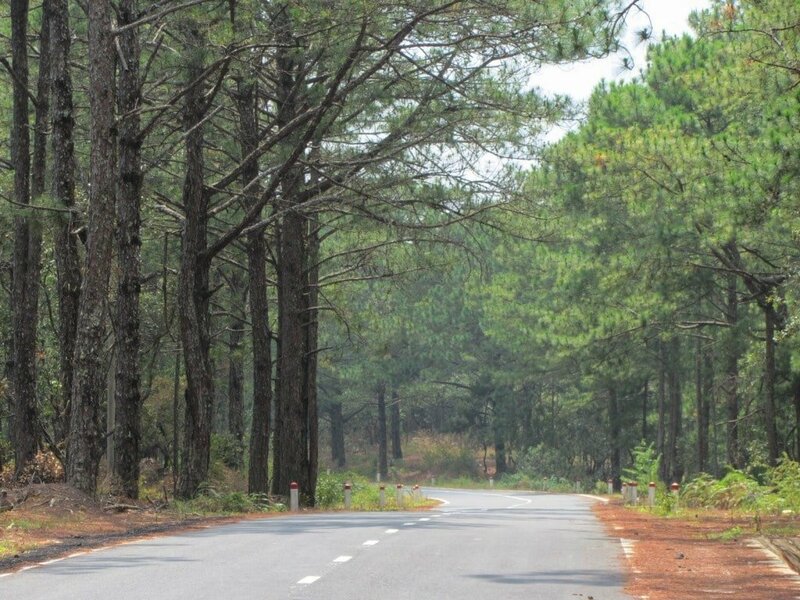 As the Pine Tree Road is only a 110km round trip from Dalat, I suggest riding it in one day – either bringing a picnic with you from Dalat or stopping at one of the few places to eat on the way. Another option is to spend a night somewhere along this route: camping in the forests (more information about that here) or staying at Lang Cu Lan Resort. 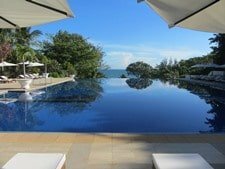 I’ve included more details of places to eat, stay and camp below. 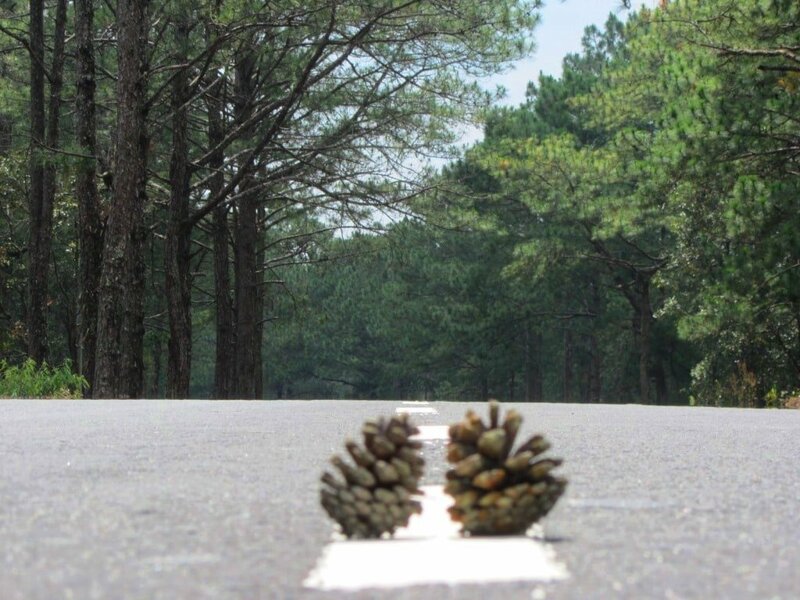 The best time to ride the Pine Tree Road is the dry season: December to March. Note: Despite many maps – online or printed – indicating that the Pine Tree Road continues west to Dak Lak Province, in reality the route is only sealed until just beyond the dusty settlement of Dung K’no, some 55km north of Dalat [MAP]. 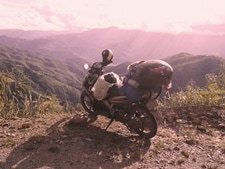 Although it’s possible to continue west from here on a dirt road that eventually joins Highway 27 to Lak Lake and Buon Ma Thuot, I don’t recommend it unless your bike can handle off-road conditions (and especially not in the rainy season). On the other hand, the Pine Tree Road is slowly being extended northwards, as part of the Truong Son Dong route, so it’s worth continuing to see how far you can go. Leaving Dalat in the mid-morning sunshine of a crisp dry season day, it’s a relief to be heading out of the increasingly exhaust-heavy air of the city. Take Tran Phu Street due west until it becomes Hoang Van Thu Street and passes the appallingly polluted Cam Ly Waterfall on the right. 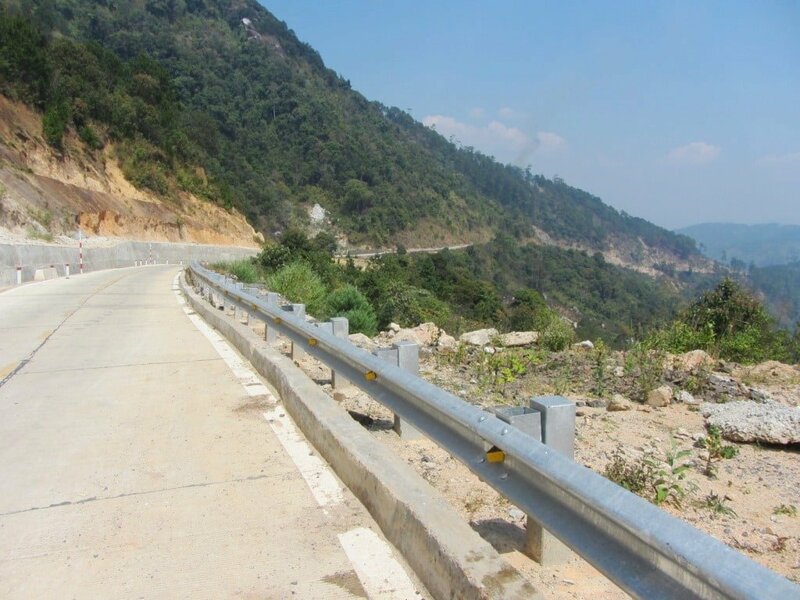 But don’t worry, this road is going to take you to an area where rivers are still clean and clear, and the extending arms of Dalat’s urban sprawl have yet to reach. Hoang Van Thu morphs into Cam Ly Road as it curls northwards, passing acres of flower, fruit, and vegetable gardens, all hiding under the plastic-covered greenhouses that make up the vast majority of Dalat’s suburbs. As the street climbs towards the junction with Ankroet Road, the flower nurseries give way to pine forests. Bearing left (due west) at the junction, you’ll see a small strawberry garden (vườn dâu tây) on the right, which is worth a quick stop in order to add something sweet to your picnic basket for the day. After a few kilometres, take a sharp right, leading down a steep hill to the exotic-sounding but, in reality, rather disappointing, Ankroet Waterfall. The falls are formed by a 1940s stone dam, which is somewhat more impressive than the cascades it produces. 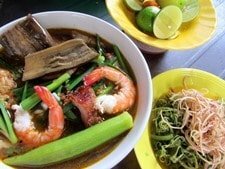 Just before the dam, Hoang Hac Quan serves good food, including Central Highlands specialities, such as cơm lam (rice cooked inside a length of bamboo). After the falls, the road (which is now called TL722) follows the shore of the Dankia Reservoir, whose pretty banks are carpeted with grass and backed by forests. It would be a nice place for a picnic if previous picnickers hadn’t left all their trash behind. Up and over a small rise, the road connects with another, larger reservoir: the romantically named Hồ Suối Vàng – Golden Spring Lake. It’s a scenic spot and there are some rustic eateries offering food by the water’s edge, but push on, because the best is yet to come and, sadly, much of the lakeshore and surrounding forest have, inevitably, been ruined by picnickers’ trash. (For more about trash in Vietnam read this). Just a couple of minutes beyond Golden Spring Lake (before the road drops into a valley), several dirt tracks lead into the pine forests. Choose one of these and follow it far enough so that you cannot be seen from the road, and you’ll find some excellent camping and/or picnic spots. A night on one of the ridges here – with views over endless pine forests and the peaks of Mt. Bà and Bidoup (the highest on the Lang Bian Plateau) – is very special indeed. 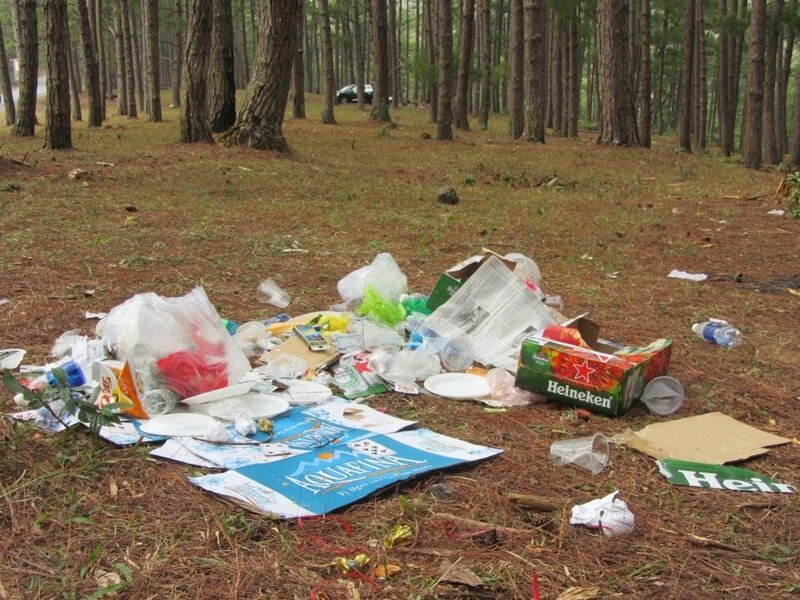 Needless to say, set an example by taking your trash away with you and leaving your camp/picnic site as you found it. Having camped here on several occasions over many years, I’ve come to refer to this ridge as The North Face, in honour of the brand of my tent. 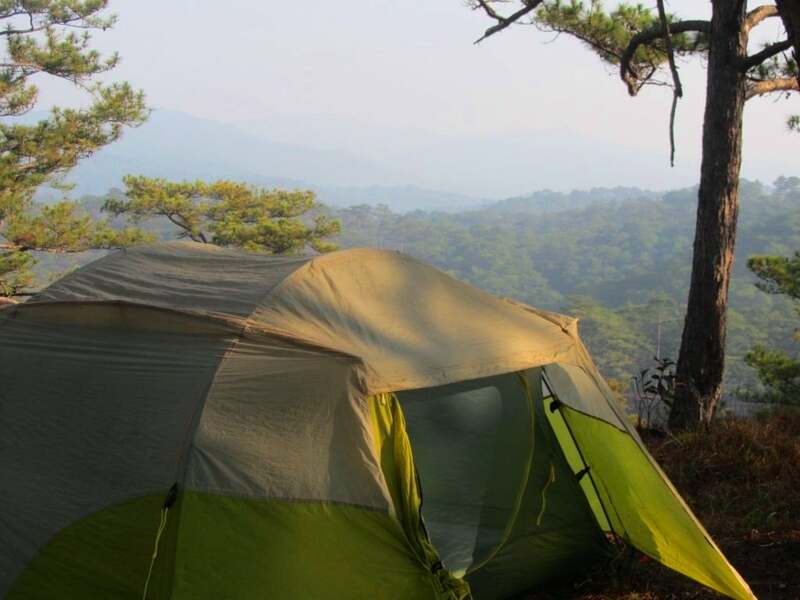 (For more details about camping here read this). Lang Cu Lan Resort is the last outpost of tourism on this route. From here on, the Pine Tree Road sheds all of its ‘Dalat-ness’, and becomes wild, remote and rarely trodden. Not long ago, the tarmac ended here too, but now a new, beautifully smooth, river of asphalt meanders for another 35km all the way to Dung K’no hamlet. The air is crisp and cool; the light sharp and fresh: it’s an invigorating ride. There are no other vehicles as you wind up and down the contours of the Lang Bian Plateau, occasionally skirting the edges of Bidoup National Park, where wild animals, such as the Asiatic black bear and black-shanked douc still (despite generations of hunting) roam in modest numbers. The pine trees stand straight and erect, lining the road in their hundreds of thousands and spreading all the way to the horizon, like a giant army standing at attention in ranks, escorting you on your way. This area even has its very own variety of pine tree: the Pinus Dalatensis or White Pine, which grows up to 40 metres high. I’m not sure exactly what it is, but there’s something about pine forests that makes me want to settle down and make a home (or at least make camp for a night). Under the perfumed canopy they are snug, comforting, soft and benevolent places to be. The pine needles create a perfect carpet on which to lay out and, at night, the wind through the treetops sounds like ocean waves breaking on a sand beach. If you’ve brought a tent along, there are plenty of paths in this area leading into the friendly forests for a night under the pines. The foliage changes suddenly after reaching the top of Đèo Cổng Trời (Heaven’s Gate Pass – one of many so-named in Vietnam). 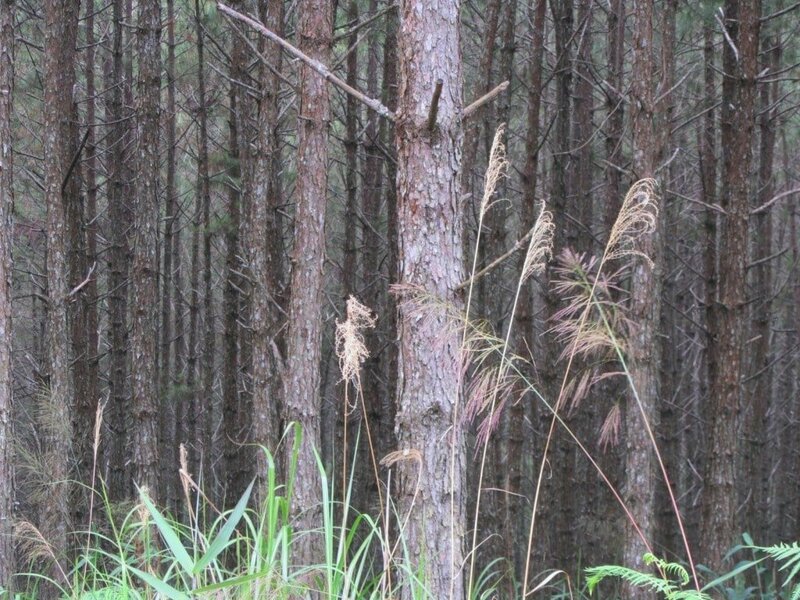 Riotous jungle takes the place of regimented pine forests. The canopy becomes dense and impenetrable, with layers of twisting epiphytes, trunks, climbers and creepers. It’s recognizably tropical as opposed to the temperate forests of earlier. I can only assume that, once over Heaven’s Gate Pass, there’s a climatic change which is favourable to a different kind of flora. There’s also a noticeable increase in human activity on this side of the pass. 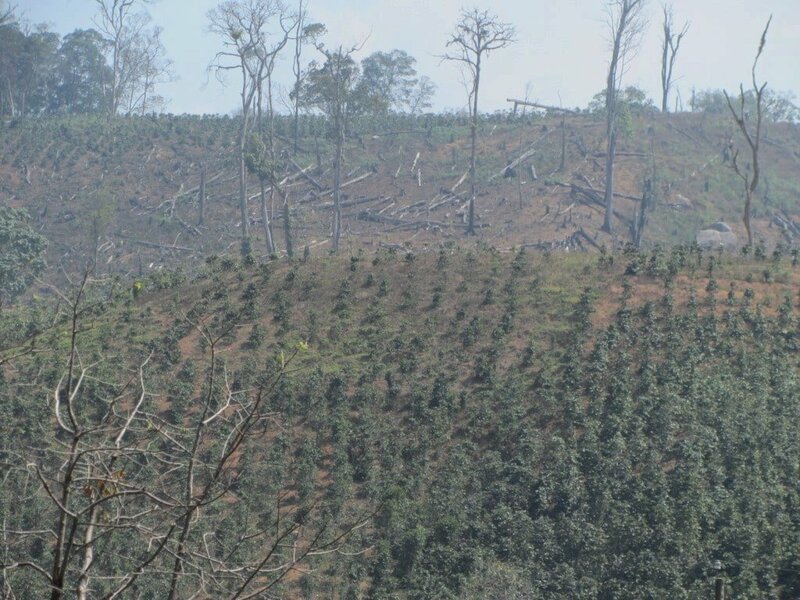 Large swathes of forest have been burned to make way for cash crops, such as coffee and corn. And parts of the forest have been regularly plundered for resources, resulting in a network of ‘bald-patches’ across the landscape. Furls of smoke rise from the valleys where piled husks of newly harvested corn are being incinerated. The rhythmic beat of chopping axes echoes from ridge to ridge as trees are hacked for firewood. All this is quite jarring at first, and some of the hillsides have the apocalyptic look familiar from photographs of napalmed forests during the war. Although the villages here are very small, the impact they have on the landscape they live in is very apparent. Traditionally, people in this area (most of whom belong to several of Vietnam’s numerous ethnic minority groups) practiced slash and burn agriculture. Nowadays, the Vietnamese government encourages them to cultivate cash crops instead. The transition results in a rather ugly hodgepodge of cleared forests, barren hillsides, and heavy machinery. But it’s hoped that the new agriculture will provide local people with a more stable income. 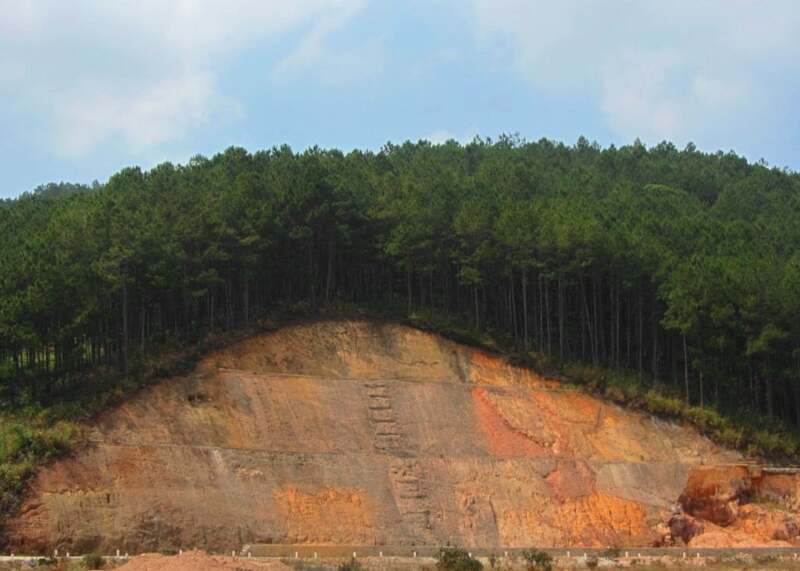 The construction of the Pine Tree Road has also made an impact on the area: from a distance you can follow the road’s progress through the landscape by tracing the scar it has made in the forest. The road has improved access to these remote minority areas, but it has also made it easier to reach previously inaccessible stands of old-growth forest, which are now being felled. The villages appear grim at first, but people are very friendly (kids jump into the road to wave as you pass by) and, on closer inspection, some of the wooden homes are reminiscent of clapboard prairie houses, sporting wooden verandas and decorative flourishes here and there. There are a few shops selling snacks and bottles of gas. 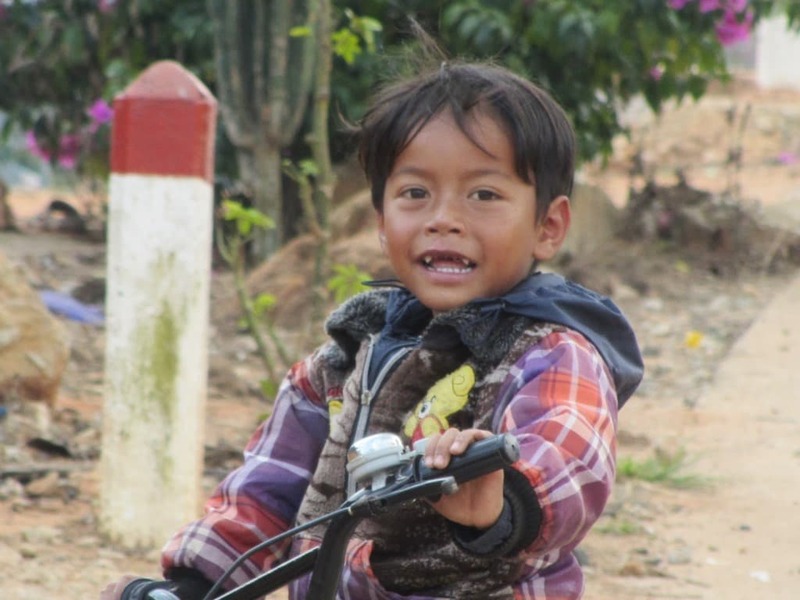 Sit down for a coffee and take a wander around one of the villages: you’re bound to make friends with a few smiling kids playing in the dust. At Dung K’no the road splinters: heading north, the tarmac continues for at least another 15km along a remote valley before ending in a series of dirt roads, which are good for exploring (this road will eventually lead to the other side of the mountains: to Dak Lak Province). Or, if you’re set on continuing to Dak Lak Province, head west through the village and negotiate your way along the dirt track which eventually joins Highway 27 (leading to Lake Lak and Buon Ma Thuot). However, it’s a long slog and even locals suggest you don’t do it. But, if there has been no rain recently and your bike is sturdy, it is possible. 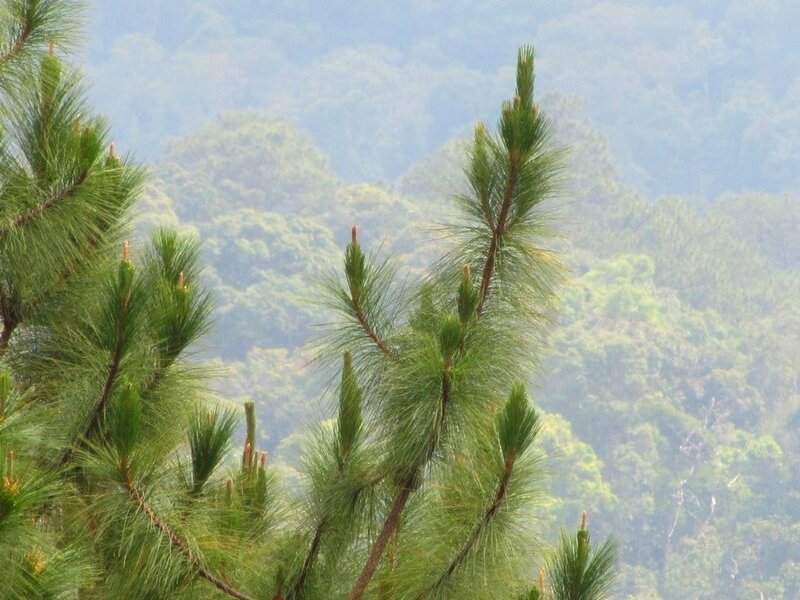 Otherwise, turn around and retrace the Pine Tree Road back to Dalat. 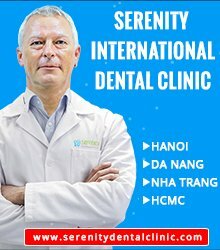 For accommodation in Dalat I choose La Nha Homestay (a great new budget option in a refurbished French villa), the Du Parc Hotel (excellent mid-range value in an impressive French colonial building), and Ana Mandara Villas (beautifully restored French villas on a hillside – by far the most atmospheric high-end lodgings in the Central Highlands). 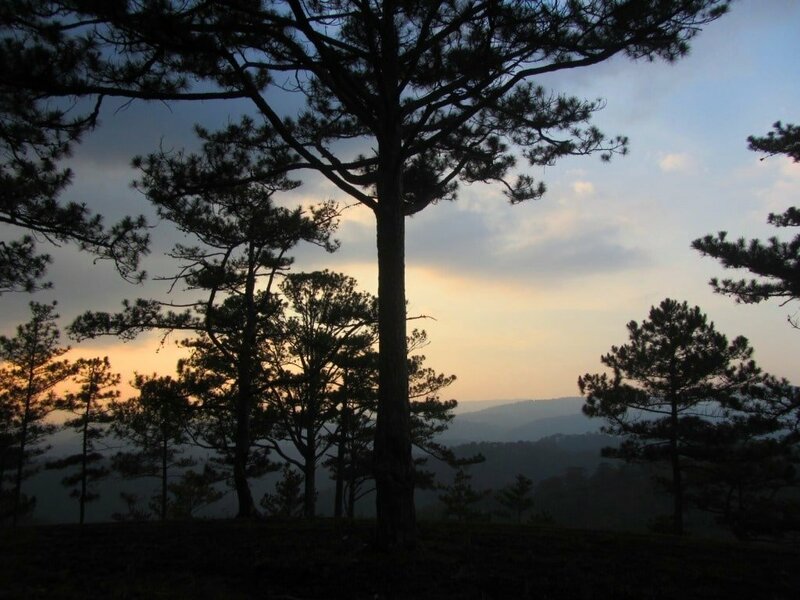 Search many more Dalat accommodation options, rates and availability here. 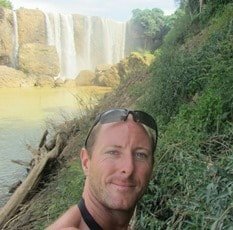 This entry was posted in ALL, Central, MOTORBIKE GUIDES, Mountains, The South and tagged camping, central highlands, Dalat, forest, guide, motorbike, pine trees, travel, Vietnam. Bookmark the permalink. I’m planning to go from Dalat to Lak Lake. Would definitely like to make the trip through this pine forest trail. Any updates on whether the westward DT722 route had been developed? As far as I know that section of DT722 is still off road, but locals do it and say it’s fine when it’s dry. I would guess that, if you’re on a CBF and it’s dry conditions and you have some off road experience, it should be OK. I drove also on the Mimosa road beautiful and I was lucky because when I Cam back to Dalat on this road the sunset was like magical orange . Thanks. That sounds great. I’m really happy to hear you enjoyed your time in Dalat and at Ana Mandara Resort – it’s lovely place. Thank you so much for sharing. I’ve enjoyed your site. Did the Pine Tree round trip today and loved it. We wanted to try the rice at Hoang Hac Quan but got kinda turned off by them specializing in “wild game.” I agree smd saw first hand the environmental points you made so clearly. Roads going deep into forests are a double edged sword. They push humans deeper into areas that were protected. If you truely love animals and nature, may I suggest a restaurant in DaLat. It’s inexpensive and authentic. If coming from Ana Mandara Villas Dalat Resort & Spa use google route “walking” to ride a shortcut through a neighborhood and over a cool bike bridge. Thank you so much for sharing. Did the Pine Tree today and loved it. We wanted to try the rice at Hoang Hac Quan but got kinda turned off by it specializing in “wild game.” If you truely love nature, may I suggest Nha Hanh Hao Sen 62 Phan Đình Phùng, Phường 2, Tp. Đà Lạt, Lâm Đồng, Vietnam. If coming from Ana Mandara Villas Dalat Resort & Spa use google route “walking” to ride a shortcut through a neighborhood and over a cool bike bridge. Great to hear that you enjoyed the Pine Tree Road. We found “North Face” easier on the return and plan to camp there. thanks for this interesting page. Is it a good idea? How is that road? Road DT722 is usually in bad condition as it heads west at the end of the Pine Tree Road as outlined in this guide. 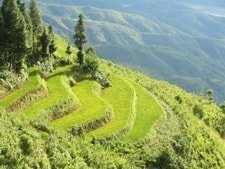 Unless you have a motorbike that is good off-road you will need to take a different route from Dalat to Buon Ma Thuot. 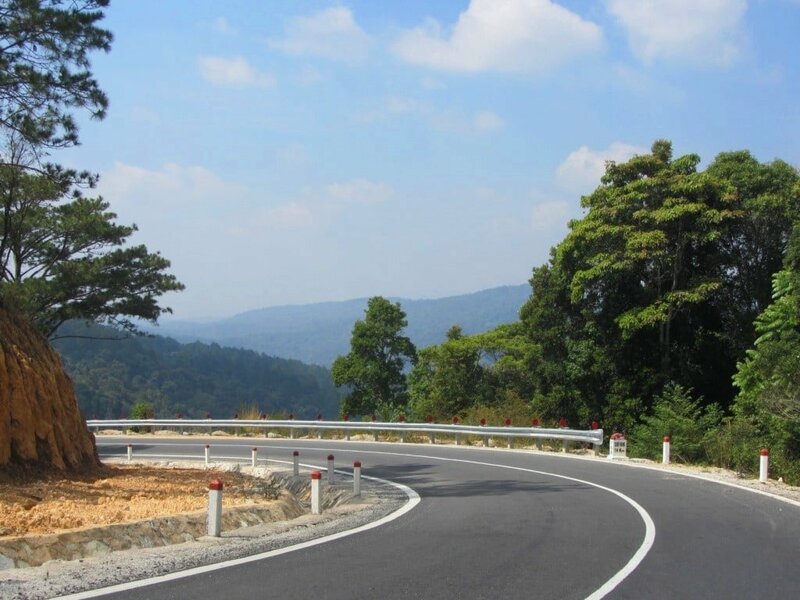 Take Road DT725 south from Dalat past Elephant Waterfall until it joins Road QL27, then take this to Buon Ma Thuot. I too was a naïve idiot and trusting the maps rode through this road on a reworked Honda Future in the rainy reason to Buon MA Thuot. Had to ride through streams upto 2 feet and all the associated mud. The path was not suitable for riding especially for the bike I was riding ( I never intended to do off roading anway). I gave up 70 percent through the road and it was only through the incredible help of some locals who rode it to the nearest village and their hospitality of hosting me for the night that I made it back to the road the next day. Yes, well apparently there’s plans to pave it, and progress is being made. Great to hear that you got some help from locals in a difficult situation. The first 30-40km as I’ve outlined in this guide is certainly worth the trip anyway. You are a real traveler. Thanks for sharing. Yes, I hope they’ll paved the road all the way sometime soon – but then, as you say, it wouldn’t be such a hidden gem anymore.